Have you ever liked the IDEA of something more than the actual thing itself? 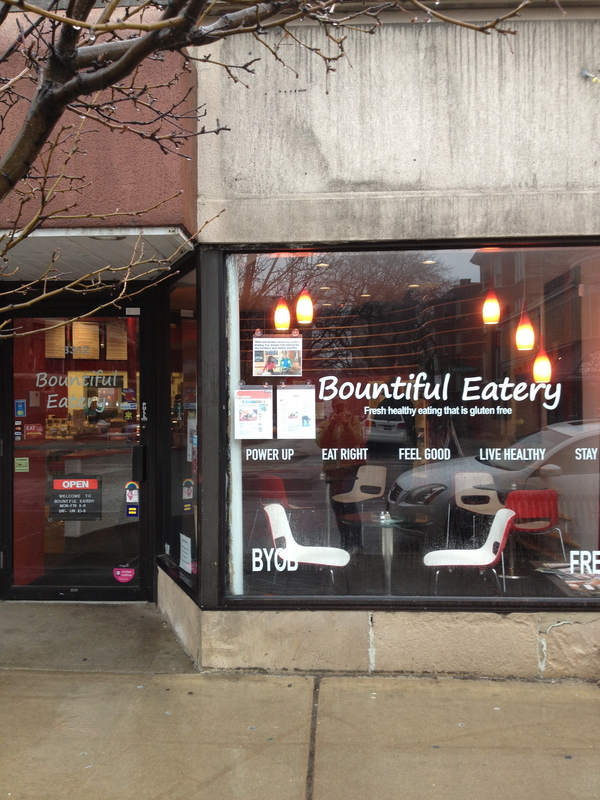 That is how I feel about Bountiful Eatery, a gluten-free, quick service restaurant located in the Lakeview Neighborhood. Yes, GLUTEN-FREE! I could eat everything here and not have to ask a bajillion questions about cross contamination or ingredients. 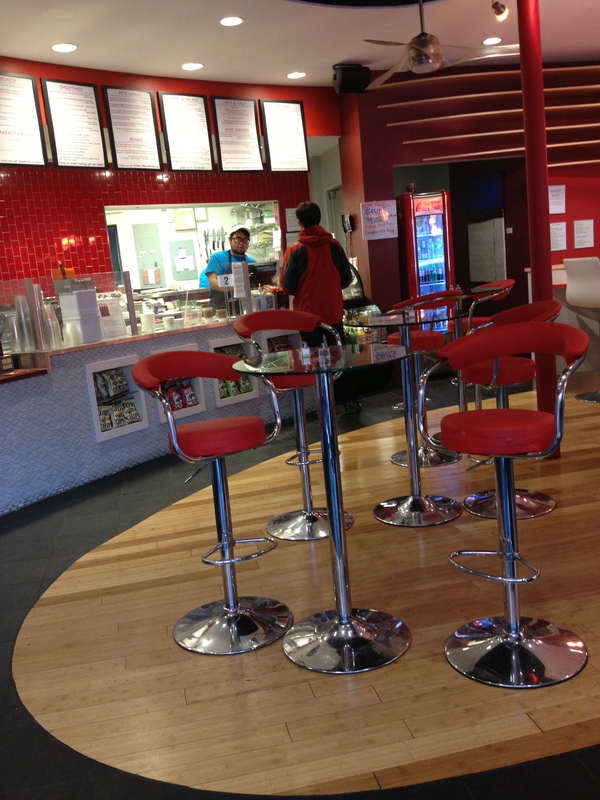 When I first learned of this restaurant, I did a happy dance. And my happy dance is a sight to behold. The first time I visited, I ended up getting my order to go. I was feeling lazy, cooking was not an option I wanted to entertain, and I had a movie waiting at home to watch, so I decided to try them out on my way home from work. Originally I was going to order the chicken kabob, but the person behind the counter made me feel like it would be such a hassle to get that, Instead, I ordered the chicken breast pita with a side salad. In general, it is known that I am a bit of a character, but I thought I would have pieces of chicken inside the pita with the spinach, tomatoes, and the “zesty yogurt spread.” What I received was a whole chicken breast placed in a pita. This was not easy to eat, and a disappointment because I really wanted hand food. The side salad was also a disappointment as it tasted like something that I could get out of a bag at my grocery store. Overall, I was disappointed, but they have brunch! My second trip was my first attempt at trying their brunch menu, but I missed the end time by about 30 minutes. So instead of pancakes I ordered a grilled cheese and turkey from the kids meal and had them add some avocado. Since I had the option of a side salad or chips, my instinct was to go for the salad, but when I saw that eating in would get me the same plastic container of salad I didn’t care for my first go round, I opted for a bag of sweet potato chips. As an added bonus, I decided to try their smoothie menu and got the Choco’Nut (low fat chocolate yogurt, banana, skim chocolate milk, and all natural peanut butter). YUM all around! The avocado added a fun twist to the grilled cheese that had me wondering why I had never tried it before, and the smoothie was a further celebration of my new found love of chocolate, peanut butter, and banana. This is a meal I would come back for, and with the 20% discount they are giving for flashing your gym card, one that clocked in around $12! If my sweet tooth needed further tempting after that smoothie, they have brownies and desert bars from Rose’s Wheat Free Bakery for sale. Third time was the charm, in terms of FINALLY getting brunch and I eagerly ordered the Pumpkin Pancakes and another Choco’Nut smoothie. After a bit of a wait, my 4 pancakes arrived with a side of fruit. Issue #1 — I had to ask for butter, or a similar substance, for my pancakes. Maybe it is just me, but shouldn’t that just come with the pancakes, along with the syrup (maple, in this instance)?? Issue #2 — the pancakes just kind of tasted blah, until my last one. That last one had that distinctive pumpkin taste with melted butter and maple syrup that I had been longing for the entire meal. Overall, the experience was just a bit meh. 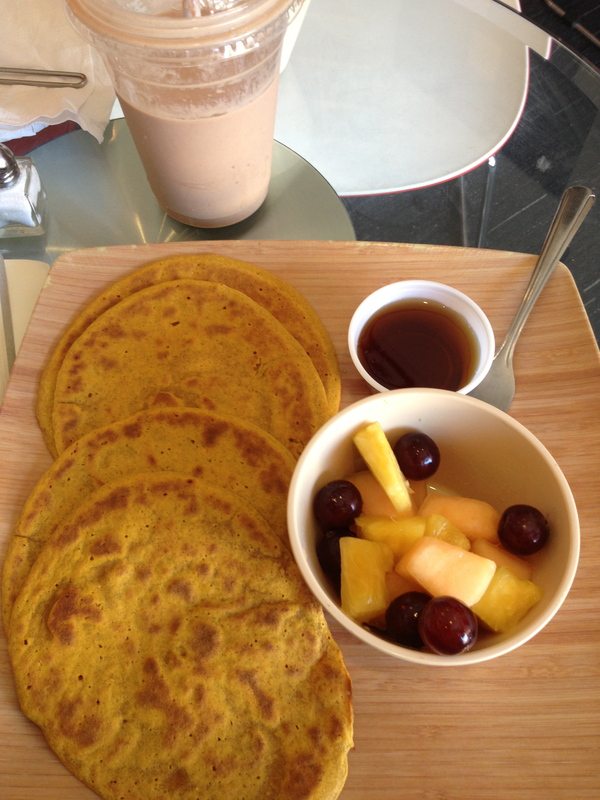 Pumpkin pancakes, fruit cup, and choco’nut smoothie.